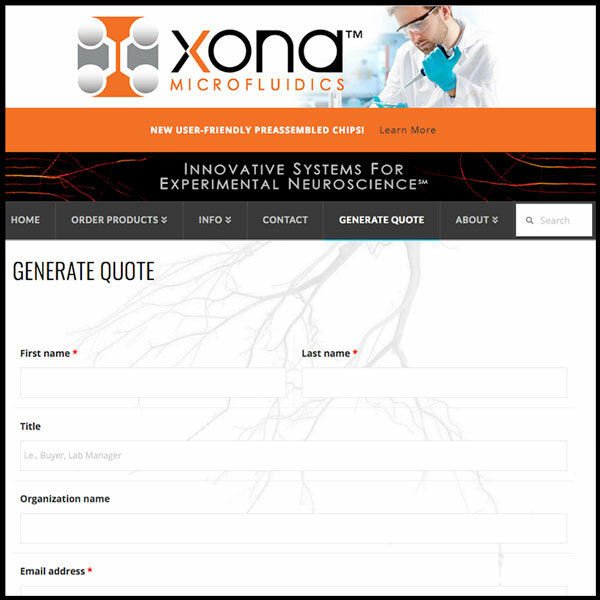 Xona Microfluidics, LLC, a global leader in bringing to market Innovative Systems for Experimental Neuroscience℠, has added the Xona Quote Generator to its website allowing customers to create their own quotes on Xona products. Often institutions require end users to acquire formal quotes before a purchase order can be placed. This can create delays in the ordering process. Now, with access to the Xona Quote Generator customers are free to create their own quotes on demand. To get a quote on ordering XonaChips™ and other Xona products, please visit https://xonamicrofluidics.com/generate-quote. In order to streamline the ordering process, Xona Microfluidics, LLC has given customers access to its quote generator on its website. This will allow customers all over the world to create and download a pdf quote any time they want. Just visit xonamicrofluidics.com and click on the “Generate Quote” tab on the home page. From there our customers can input their contact information and select the products and quantities they are interested in purchasing. Once the data is entered the quote can be downloaded in pdf format. The quote will have Xona’s letterhead on it and will serve as an official quote from Xona Microfluidics, LLC. Please note certain terms and conditions apply as described on Xona’s website. For more information on our new XonaChip™ visit xonamicrofluidics.com, and to get a quote on ordering XonaChips™ and other Xona products, please visit https://xonamicrofluidics.com/generate-quote/. Xona Microfluidics, LLC is a located in Temecula, California with R&D offices located in Research Triangle Park, North Carolina. More information can be found at xonamicrofluidics.com. If you are interested in testing a XonaChipTM contact us at info@xona.us.